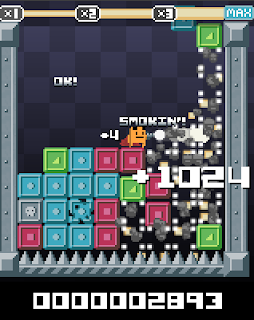 I normally have a rule against mentioning flash/web browser games on this blog, but in the case of Super Puzzle Platformer I'll make an exeption as there's a downloadable PC/Mac version available from Andrew Morrish's Mod/IndieDB page, but also (and mainly) because it is incredibly fun. 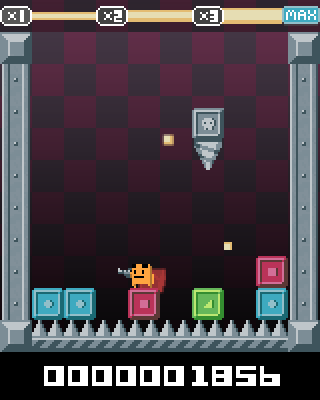 Described elsewhere on the net as "Mr. Driller in reverse", Super Puzzle Platformer is all about blasting blocks, collecting points and avoiding untimely death by falling on sharp spikes below or being crushed from above. Jumping around the claustrophobic game-arena to a excellent and well-fitting chip tune by Landon Podbielski, your goal is to simply help the gun-toting, cape-wearing Mr. Serious survive as long as possible in the face of impossible odds. 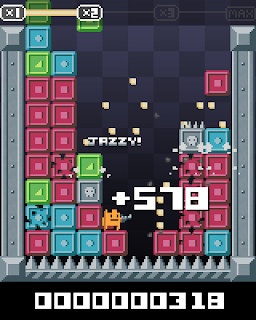 Coloured blocks (of three types) constantly fall from the top of the screen, and blasting them releases little coins that are collected to both upgrade your weapon and give you a Sonic-style hitpoint (which can save you from being crushed). Shooting groups of blocks will release multiple points and more coins, and it's advisable to keep the screen as clear as possible so you can avoid the treacherous danger waves of blocks with just one gap to squeeze through, deadly spike blocks and fearsome drills. It's a simple yet addictive game design with an awful lot of potential, and the endearing low-resolution graphics give Super Puzzle Platformer a classic and authentic retro feel. Starting with a quick introduction to the controls, the blocks begin descending from the top of the screen at a pedestrian pace, but it isn't long before the game becomes a cacophony of exploding coloured pixels and arcade noise, with little messages rewarding your efforts thrown up at the screen at the same machine-gun pace I last witnessed whilst playing Rob (OddBob) Fearon's ill-fated G-Force. Each game is over in a matter of minutes, and after a brief and classic coin-op style highscore display you can (and will) jump back in immediately for another round. There's loads of nice little aesthetically-pleasing touches here, such as the screen shaking when multiple blocks are destroyed, the recoil from your gun (which becomes more apparent as you upgrade) and the way that Mr. Serious' cape flows behind him as he leaps from one near-death experience to another. Before you know it, it's 4am and you've got work the next day - the game really is that compulsive. I would love to see this winning formula take the same sort of route to a full commercial scale game that Team Meat did with their original flash-based Meat Boy. It has so much promise, and it would only take the addition of features such as proper Mr. Driller style challenge stages, player profiles and perhaps even a two player battle/co-op mode to move the game into saleable quality territory. Hell, I'd pre-order a copy now if this was even a remote possibility. The only downside is that as a flash game it requires a PC with a bit of oompf to play without any slowdown (my small Eee PC 1008HA with it's 1.6Ghz processor isn't man enough for the task, although my 6-year old mid spec desktop runs it fine), and at the moment it isn't set up for competitive hot-seat play as you only get an option to enter you initials once (at start-up). These minor gripes aside, Super Puzzle Platformer is quite frankly awesome, so do yourself a favour and download a copy now. Great review of a fantastic game! "I normally have a rule against mentioning flash/web browser games on this blog"
Err, why? There are some stunning brilliant Flash games being released. It's a personal thing; I just don't like games that force me to be online to play them, and I hate advert-laden browser-game sites. I tend to play games while commuting to meetings or training at work, lunch breaks, etc. and don't always have the luxury of a wifi connection. Thanks for the replies :) @Ninjuit; I know what you mean about the style - anti aliasing seems to be going out of fashion in pixel art these days in favour of a more retro, blocky look. However, SPP is a great example of how to do simple, retro graphics with flair - the animations are super (the explosions in particular) and I love the choice of colour used here.